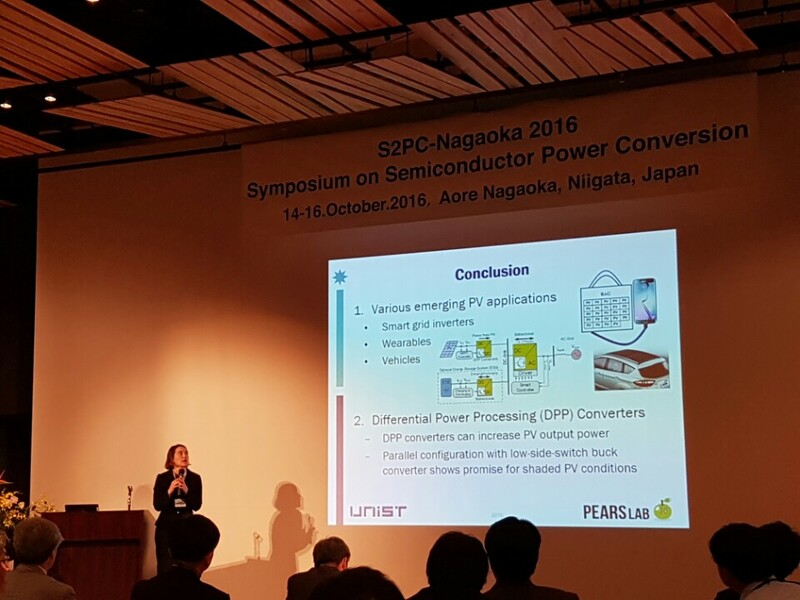 Prof. Katherine Kim and graduate student Kyoungjun Kwon attended the Symposium on Semiconductor Power Conversion (S2PC) in Nagaoka, Japan on October 14-16, 2016. Prof. Katherine Kim gave a presentation on “Differential Power Processing Converter Techniques for Emerging Photovoltaic Applications” (see photo below). 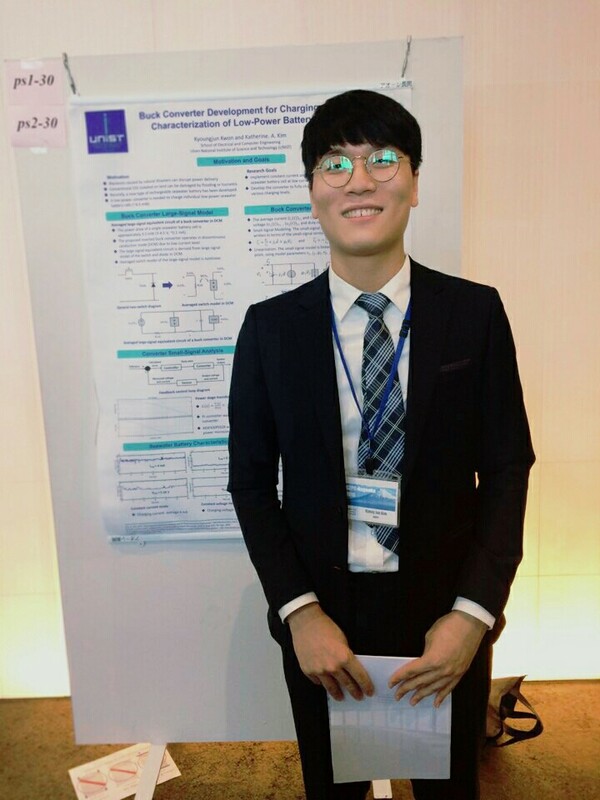 Kyoungjun Kwon presented a poster on “Buck Converter Development for Charging and Characterization of Low-Power Battery Cells” (see photo below). 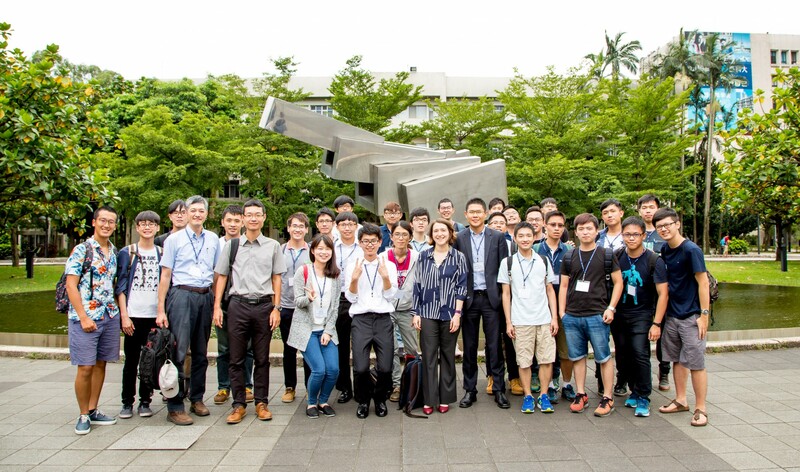 Prof. Katherine Kim visited the Power Electronics Lab at National Taiwan University of Science and Technology (國立臺灣科技大學) in Taipei, Taiwan, and also gave a talk on “Photovoltaic Power Converters for Smart Grid Capability” at the PELS/IAS/IES Taipei Joint Symposium on August 10, 2016. The symposium featured research presentations from National Taiwan University of Science and Technology (NTUST), National Taiwan University (NTU), and National Tsing Hua University (NTHU). Prof. Katherine Kim and graduate student Hyunji Lee attended IPEMC 2016-ECCE Asia in Hefei China. Hyunji Lee presented her research paper on “Differential Power Processing Converter Design for Photovoltaic Wearable Applications” as shown below. Prof. Katherine Kim gave a career development talk at the IEEE PELS Women in Engineering breakfast entitled “Impedance Matching your Power Electronics Career” and served as a Session Chair for the “Smart Grid Technologies I” Session. Prof. Katherine Kim attended the Applied Power Electronics Conference 2016 in Long Beach, CA, USA in March 2016. At the IEEE PELS Women in Engineering breakfast, Prof. Katherine Kim gave a career advice talk entitled “Impedance Matching your Power Electronics Career” and served as a Session Chair for the “Renewable Energy Systems” technical session. Prof. Katherine A. Kim has been elected to serve as a Member-At-Large for the IEEE Power Electronics Society (PELS) Administrative Committee. She will serve for three years from 2016 to 2018. Prof. Kim has previously been involved in PELS as the PELS Student Membership Chair in 2013-2014 and as a member of the PELS Student and Young Professionals Committee from 2013 to present. She is honored to receive the Member-At-Large position and looks forward to contributing to the IEEE PELS and the world-wide power electronics community. The Fall 2015 semester is underway at UNIST! Description: Introduction to Controls is an upper-level undergraduate course where you will learn the fundamentals of dynamic system analysis and control theory. Projects and teamwork are important aspects of this flipped-learning-based class. The primary goal of the course is for students to finish the semester with a clear understanding of various realistic dynamic systems and how to design and analyze an effective controller. Description: Power Electronics for Energy Harvesting is a Special Topics PhD level course where you will learn the basics of energy harvesting technologies and associated power electronics topology and control methods. The primary goal of the course is for students to gain a clear understanding of power electronics techniques for low-power energy harvesting applications. We are excited to have a new undergraduate student, HoaeJeong Jeong (정회정), who has joined the PEARS Lab! “Reexamination of Photovoltaic Hot Spotting to Show Inadequacy of the Bypass Diode,” by Katherine A. Kim and Philip T. Krein, in IEEE J. Photovoltaic., vol. 5, no. 5. pp. 1435-1441, Sept. 2015. “Fluorescent Light Energy Harvesting Using a Capacitive Touch Screen,” by Seulkirom Kim, Katherine A. Kim and Franklin Bien, in Electronics Letters, vol. 51, no. 21. pp. 1695-1697, Oct. 2015. The UNIST 2015 IEEE International Future Energy Challenge (IFEC) Team traveled to Dearborn, MI, USA, to test their wireless power transfer prototype for the Topic A (High-efficiency Wireless Charging System for Electric Vehicles and Other Applications) competition. Team members were Sangyeong Jeong, Mina Kim, Hyeun-Tae Cho, and Zhanibek Bizak. Faculty advisors were Prof. Katherine A. Kim, Prof. Jeehoon Jung, and Prof. Jingook Kim. The four-student first-time UNIST Team competed in the IFEC competition and the gained valuable experience designing, building, and testing power electronics hardware. Through the competition, students learned to work as a team and gained experience in making challenging, real-world power electronics hardware that they will use as finish their education and go on to graduate school. Graduate student Hyunji Lee attended the 2015 Workshop on Control and Modeling for Power Electronics (COMPEL) in Vancouver, Canada. She presented a poster for the paper entitled “Comparison of Photovoltaic Converter Configurations for Wearable Applications” in the Energy Harvesting and Power Management Poster Session on Tuesday, July 14, 2015. Hyunji Lee was also honored to receive the 2015 COMPEL Student Travel Grant Award to help make her trip to the conference possible. 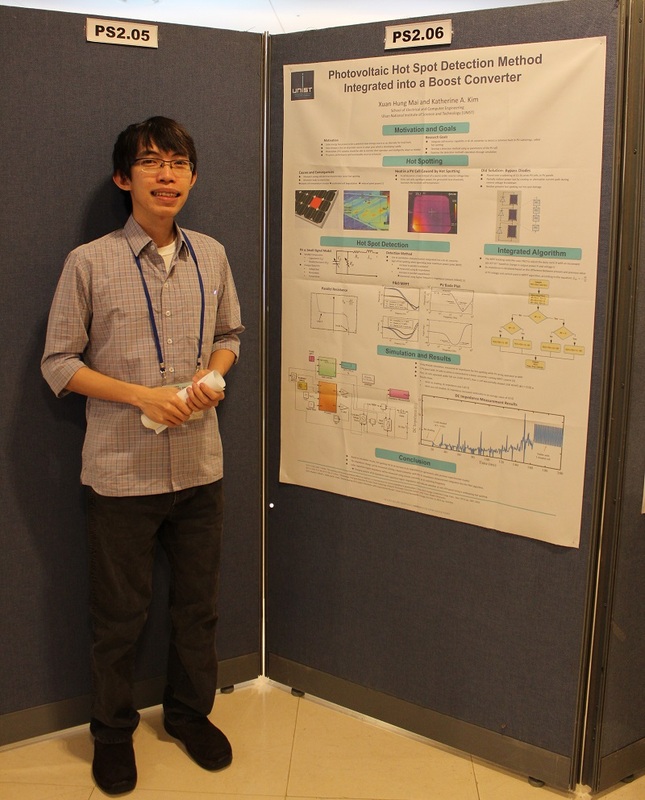 Xuan Hung Mai presented a poster for the paper entitled “Photovoltaic Hot Spot Detection Method Integrated into a Boost Converter” on Tuesday, July 7, 2015. 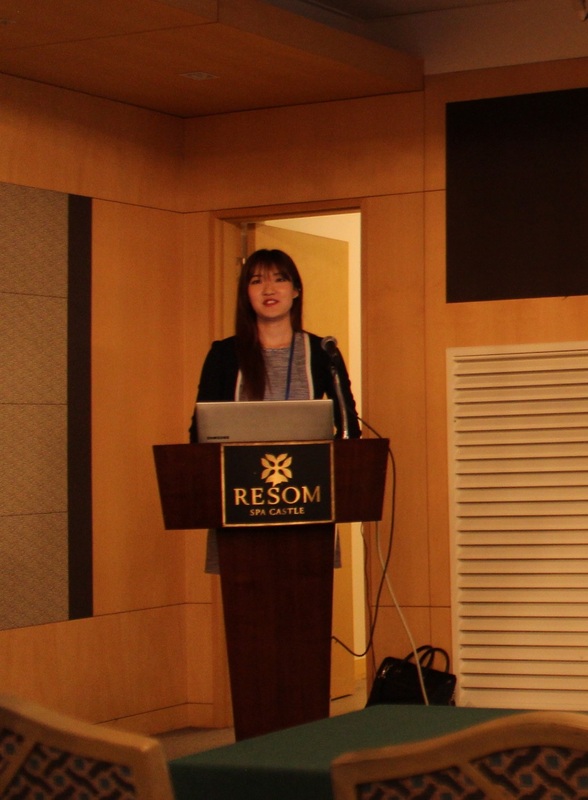 Hyunji Lee presented the paper entitled “Efficiency Analysis fo Photovoltiac Configurations in Wearable Charging Applications” on Thursday, July 9, 2015. 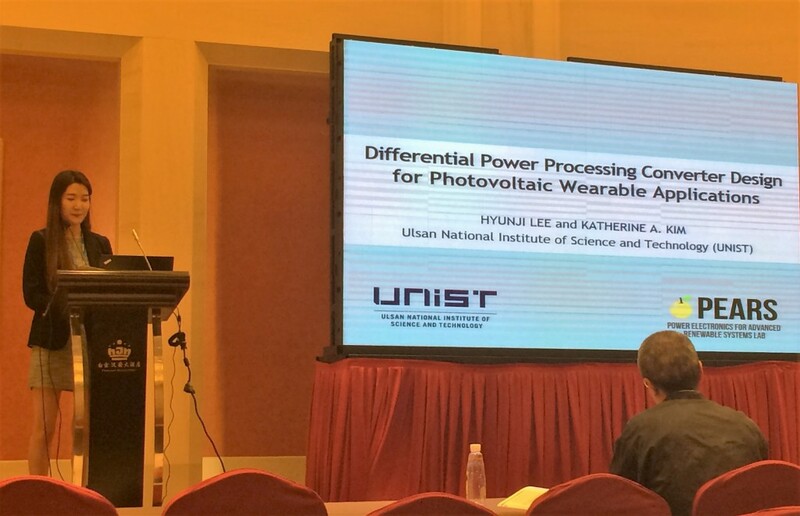 The paper entitled “A Dynamic Model of Single Crystalline Photovoltaic Cells Incorporating Thermo-Electric Characteristics” was also presented on Thursday, July 9, 2015. 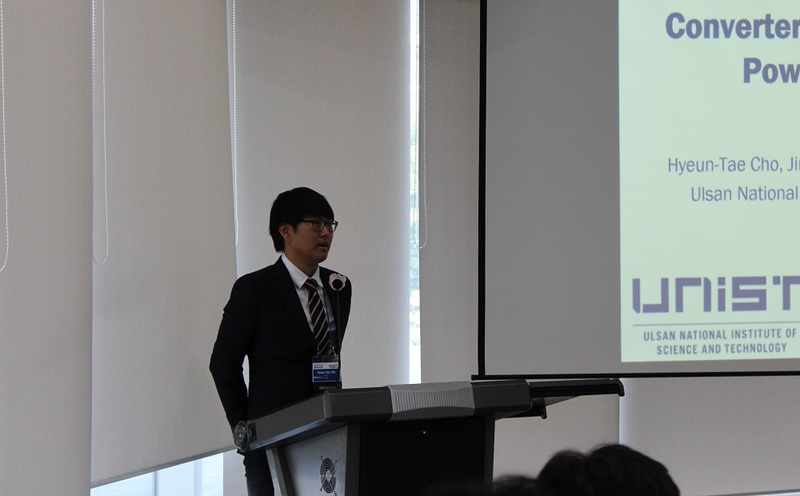 Sangyeong Jeong presented the paper entitled “Analytical Investigation of Optimal Wireless Power Transfer Topology for Electric Vehicles” on Friday June 5. Mina Kim presented the paper entitled “Design Methodology of a 500 W Wireless Power Transfer Converter,” on Saturday June 6. Hyeun-Tae Cho presented the paper entitled “Comparison of Input Power Factor Correction Techniques for Buck Converters in Single-Phase Wireless Power Transfer Systems” on Saturday June 6. 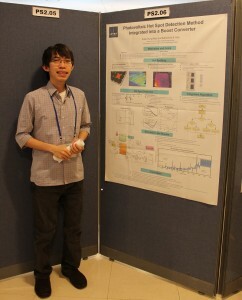 Congratulations to Hyeun-Tae Cho for sucessfully completing his first conference presentation! 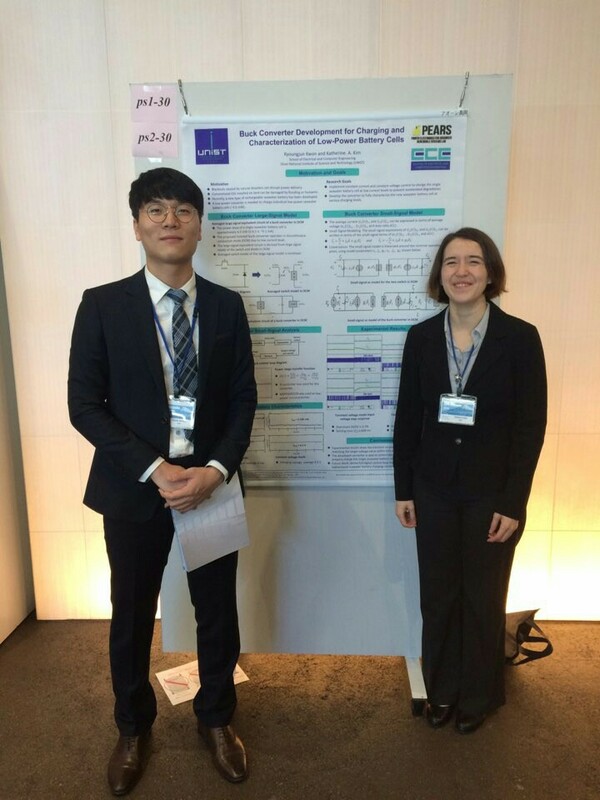 On June 1-5, 2015, Prof. Katherine Kim attended the International Conference on Power Electronics(ICPE)/ECCE-Asia in Seoul, South Korea. She co-chaired the Renewable Green Energy 2 Session on June 2, and presented the paper entitled “Photovoltaic Hot Spot Mitigation Using Voltage-Threshold Control At The Panel Level” on Thursday, June 4, in the Renewable Green Energy 4 Session. 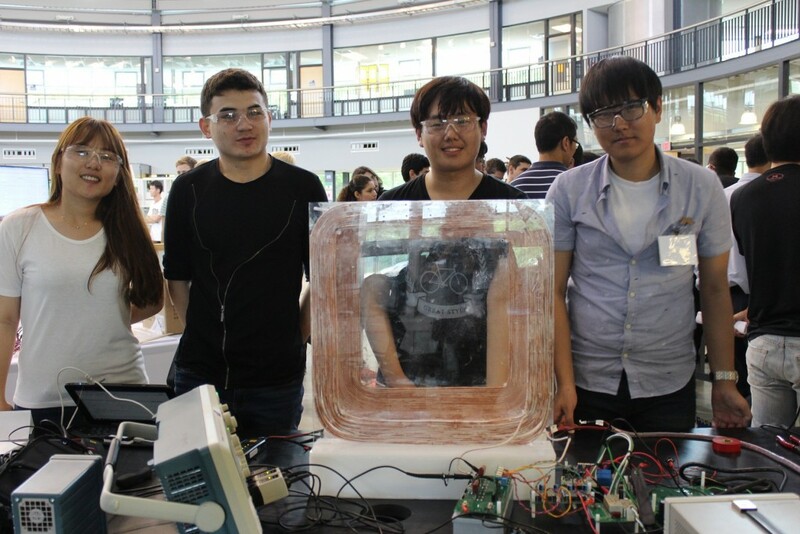 A team of four undergraduate student (including PEARS Lab students Hyeun-Tae Cho and Zhanibek Bizak) has been selected to compete in the final competition of the 2015 IEEE International Future Energy Challenge. They are competing in Topic A where they are building a High-Efficiency Wireless Charging System for Electric Vehicles and Other Applications. The team is currently building and testing the wireless charging system in preparation for the final competition at the University of Michigan-Dearborn, MI, USA, in July 2015. 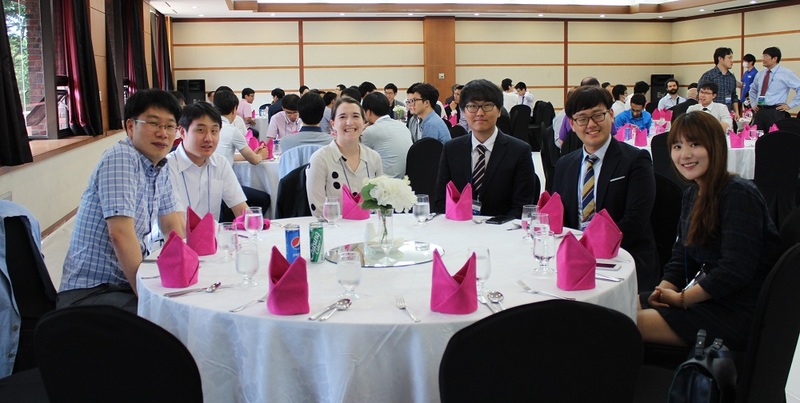 Team members (as shown in the picture) are Zhanibek Bizak, Sangyeong Jeong, Mina Kim, and Hyeun-Tae Cho. Faculty advisors are Prof. Katherine A. Kim, Prof. Jeehoon Jung, and Prof. Jingook Kim. Prof. Kim would like to thank her EE313 students for being very responsive and adaptive to her non-traditional method of teaching, and for giving her excellent feedback on how to further improve the course. She plans to teach the course again in Fall 2015. The spring 2015 semester has started at UNIST! This semester, Prof. Katherine A. Kim is teaching a newly-established graduate course on power systems (based on the previous Special Topics course). Description: Power Systems is a graduate level course where you will learn the basics of the electric power grid and present-day research challenges in power systems. The primary goal of the course is for students to gain a clear understanding of how the power grid and power systems functions and to be able to communicate that understanding to their peers. Check out their profiles under the People tab. Prof. Katherine A. Kim attended the IEEE Industrial Applications Society Annual Meeting on October 5-9, 2014 in Vancouver, Canada. Description: This course introduces fundamentals of linear systems control: mathematical modeling, analysis, and design of systems, transfer function, root locus, bode diagram, Nyquist method, and state space method. Description: This special topic course on Power Systems is a graduate level course where you will learn the basics of the electric power grid and the challenges of moving towards a more intelligent grid.